2004 Annual Report – Direct Action Welfare Group Inc. The D.A.W.G. co- sponsored the Family Leadership Conference. The Conference brought over 100 families from all over the state together to learn about issues that affect them and their families. Costs of the conference were covered by the sponsors so that families had no out of pocket expenses. The Conference is unique in that it allows the entire family including children to come and participate in informative workshops and fun activities. Workshops included a Youth Town Meeting, Welfare Rights, Teen Parenting, Multi-Disciplinary teams, Relatives as Parents, No Parent Left Behind, Individual Education Plan, and a beginners and advanced legislative training. D.A.W.G. held a two day clothing giveaway for children in the Kanawha Valley that had been affected by the state cuts to clothing vouchers and welfare. Over 200 children were given clothes and shoes and 150 families were able to receive gift cards to purchase new clothing and shoes. The clothing remaining after the two days was boxed and sent to flood victims in southern West Virginia. D.A.W.G. partnered with numerous other statewide advocacy groups to work with Every Child Matters to register and educate voters on children and family issues for the 2004 presidential election. Among the activities were a candidate survey, issues briefs, and onsite voter registration at each event and rally hosted by a partner organization. D.A.W.G. staff and teens joined grassroots welfare rights groups from all over the United States at the annual conference of the National Welfare Engine in Washington DC. During the three day conference, groups met to share concerns and successes from their individual states and to develop a national agenda. In addition to TANF, national concerns included Housing, Healthcare, Child Care, Education, and the Budget. In May 2004, the West Virginia Department of Health and Human Resources (DHHR) announced drastic cuts to TANF programs which included cuts to child care, clothing vouchers, transportation, and a 25% cut in monthly welfare checks. As well as totally eliminating several programs. Shortly after the cuts were announced D.A.W.G. called a meeting of advocates and families impacted by the cuts to develop a plan of action. The group called together by DAWG became known as the Stop the TANF Cuts Group and the Stop the TANF Cuts Campaign was born. Out of the first meeting an alternative budget was developed. This budget stopped the majority of the cuts by stopping the transfer of money from TANF programs to social service programs and by not increasing administrative costs that were slated for increase in the DHHR budget. The alternative budget was rejected by the administration. A call in/email campaign was started. People were directed to send comments on the proposed plan to DHHR during the public comment period. Over 600 complaints were received, including complaints from DHHR workers who would have to quit their jobs if child care assistance was cut. the cuts to child care. In July, a delegation of families and advocates, followed by Associated Press, delivered an open letter to the Governor urging him to stop the cuts to welfare checks which would go into effect on August 1. The letter was signed by 96 organizations and individuals including WV Council of Churches, WV Child Care Association, WV Coalition Against Domestic Violence, WV Childcare Centers United, Welfare Law Center, the American Friends Service Committee several doctors, clergy, and university professors. Governor Wise never responded to the letter or any other letters or requests for meetings by advocates or families to discuss the cuts. In September during legislative interims, a teach-in and rally was held at the capitol once again families and advocates spoke out against the cuts. Delegates Bonnie Brown and Barbara Fleischauer also spoke. Shawn Fremstead from the Center on Budget and Policy Priorities presented a recent analysis he had completed on WV TANF spending and administration costs. He also met with legislatures and reporters to discuss the analysis. Teens including a teen mother at the rally corned Paul Nusbaum, Secretary of the DHHR and questioned him about the cuts. They were not given a straight answer. The next day, a day of training was held for families. In October Health and Human Services announced that WV would be award TANF bonus money. We developed recommendations on spending the money. The recommendations included restoring the cuts to school clothing vouchers, restoring intensive case management for families with multiple barriers, and honoring their commitment to fund a donated car program. D.A.W.G. met with clergy members of the WV Council of Churches for a briefing prior to their meeting with Governor Wise. A sign on letter was developed and sent to Governor Wise with signatures from 132 organizations and individuals. Signers included the WV Chapter of the American Academy of Pediatrics, WV Chapter of the National Association of Social Workers, WV Kids Count Fund, Catholic Community Services, Women’s Club, Prevent Child Abuse WV, clergy members, DHHR workers, and University department heads. Again there was no response from the Governor. However, he did hold a press conference announcing that he would restore the school clothing voucher cuts using the bonus. 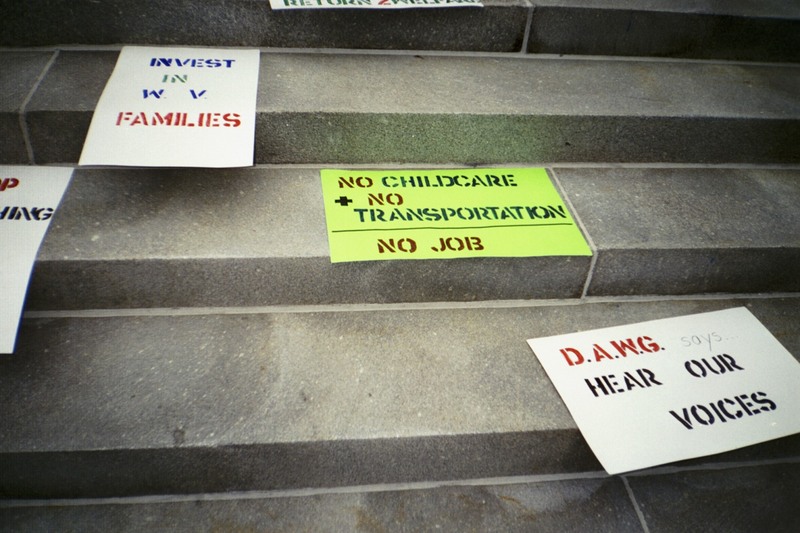 The Stop the TANF Cuts Campaign still remains a large part of D.A.W.G.’s work.